Our first "green" Eat'n Park now open in Fox Chapel! We are celebrating the opening of a brand new Eat’n Park location at the Waterworks Mall in Fox Chapel. 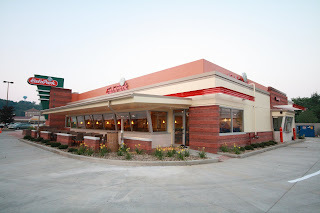 In building this Eat’n Park, we’ve incorporated a few guest favorites that are popular at other Eat’n Park locations, including a takeout pickup window and outdoor seating. However, what really makes this location special is that it’s the first LEED-built restaurant in the City of Pittsburgh. Designed to reduce energy consumption and overall impact on the environment, LEED-certified buildings like this one often have unique (and sometimes not-so-obvious) features that contribute to the structure’s energy efficiency. The Waterworks Eat’n Park is no exception. It's packed, inside and out, with features that reduce our environmental impact. Some, like the 40-foot wind turbine that will generate some of the restaurant’s power, will be obvious as soon as you pull into the parking lot. Others, like our induction stovetops, won’t be visible to most visitors. So, we thought we’d share a little sneak peek with you here. Just scroll down to see pictures of some of the outdoor features. For a look inside the restaurant, click here to watch WPXI's video tour. On the right, you can see our pick-up window, which makes Eat’n Park takeout oh so fast and easy. On the left, there’s an outdoor dining area where guests can take advantage of the warm summer weather. This is one of our new “green” features. We’ve installed drought tolerant landscaping that requires very little watering. 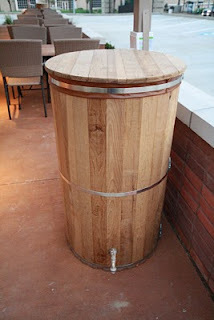 However, during really dry spells, we’ll use water from rain barrels like this one, which collect rainwater from the roof for later use. I am happy to see that Eat n Park is committed to sustainable environments, especially since you will be building a restaurant at the Schenley Plaza. How about installing a green roof, with a native meadow, wild flowers and grass? This would be stunning, and memorable. i was there today and sat at the counter since it was crowded and i was by myself. i am happy that you chose that location and made it more green. i will definetly come there to eat often. Well, KC, the Fox Chapel does feature a semi-"green" roof, which is white. This deters a surprisingly large amount of heat from entering the building compared to most roofs, which are asphalt. But a garden-top roof would even better for the Schenley location! How about building a eat in park in the Bloomfield area. You have to travel so far just There use to be one in Garfield but they closed it years ago and cannot understand why they did not open another one close by Bloomfield would be great with all the older people and younger people that cannot drive. Its time to open up an Eat N Park in the Philly area! Not in the city, but Willow Grove Area!!! This looks really nice. Living outside of PA, we really miss Eat n Park and have to travel to get to them. I love Eat N Park but have to travel to Indiana, PA to visit one. Anyway you could build one in Punxsutawney, Pa? I am sure the restaurant would be packed by residents and the I.U.P. students from our campus. Sure hope you will consider this as we in Punxsy love to eat out and you offer a wonderful selection for families. It would have helped if you had defined what "LEED" stands for. 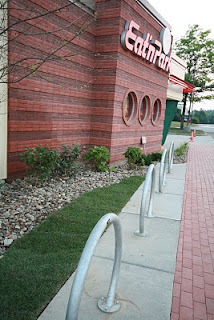 The bike rack would be great if there was a good safe way to get to your restaurant by bike! The Waterworks Mall has specifically prohibited bicycle traffic for years and Freeport road is one of the most bike-unfriendly roads in the area. Try riding from anywhere in Fox Chapel or Blawnox to this restaurant and you will be fearing for your life! It would be great to see some local effort to make the are more bike friendly. I bet you would be surprised to see how many people would bike to the Waterworks area if they could do it safely. Smiley Cookie Lane...yes, it's a real street!